Matthew McConaughey turns in a phenomenal, committed performance in the credible Dallas Buyers Club, further cementing his shift from rom-com doormat to serious, respectable actor. Based on the real-life story of Ron Woodroff, an AIDs victim-turned-activist during the deadly diseases mid-to-late 1980s peak, the film is somber and potent in its portrayal of Ron’s undying courage, yet ultimately hampered by an all too too hooey finale. When homophobic electrician Ron (McConaughey) collapses and winds up in hospital, he’s diagnosed with the AIDS virus, known to him only as “the gay disease”. Shocked that his reckless behaviour has landed him in such a horrific place, and with the only US approved treatment wreaking havoc on his already ravaged body, Ron turns to a concoction of drugs available South of the border in an attempt to not only prolong his own life, but also the lives of other sufferers. Dallas Buyers Club, without a shadow of a doubt, is a film propelled by McConaughey’s unflinching performance as Ron, so much so that the characters steady thawing from bitter, unsightly cowboy into an unlikely activist is compelling in its authenticity. It’s a terrific character study – one set against the backdrop of a horrendous period, when AIDS was rampaging across the world, killing people right, left and centre, yet no one seemed to be doing much of anything to contain it. McConaughey is matched in his efforts by a fearless Jared Leto, who portrays fellow AIDS victim – and Ron’s eventual right-hand man – Rayon. The two are held up no end by Jean-Marc Vallée’s decision to direct with restraint and candidness, a tact that accentuates both the actors’ resolve and the unlawful lengths victims of the disease were forced to go to in order to receive the treatment they deserved, and that the money-obsessed medical boards weren’t authorising. It’s unfortunate, then, that Craig Borten and Melisa Wallack’s by-the-numbers screenplay, and the lack of attention awarded to observing the bigger picture (for example the universal impact of the AIDs epidemic), lets the film down, particularly towards the end, which feels contrived and stiff in comparison to the stark, emotionally honest intensity that came before it. 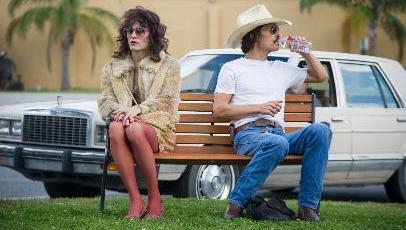 In that respect, Dallas Buyers Club is a competent film made exceptional by two distinguished performances. I never liked Matthew McConaughey until Mud, when he finally proved he can act. I’m really looking forward to this now, and plan to see it when it’s released here in the UK. Thanks for the heads up re the film’s flaws, I’ll adjust my expectations accordingly! Republicou isso em erica dias dot ME.